Part of the old wall of the City of Wetzlar, Germany, dating to the medieval ages…now incorporated into a a much more modern dwelling. A touch of color on an otherwise bleak November day from the barberry below. Sony DSC H50 at full wide (31mm equivalent). F4.0 @ 1/160th @ ISO 100. Programmed Auto. Recovery for the sky in Lightroom. Added Clarity and Vibrance. Blackpoint slightly right. Sharpen Landscapes preset. 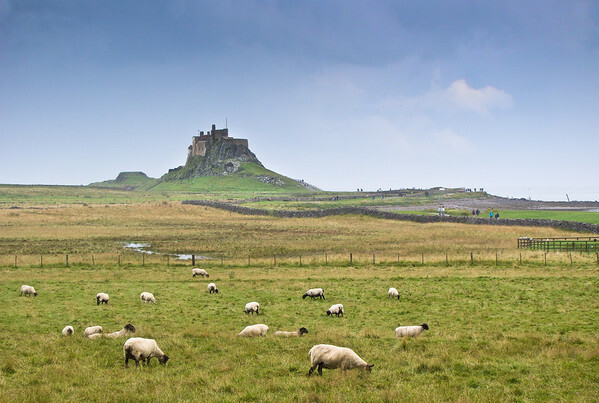 Lindsfarne Island, the Holy Island, is accessible by road at low tide and several hours either side. The road runs across what amounts to the sandy bottom of the sea. The Island has been held sacred for centuries. I suspect it already had a reputation for spirituality when the Celtic monks arrived during the dark ages and turned it into one of the few seats of learning left in the western world. It was the trump card of our trip to Scotland, though it is well south of the Scottish border and only by a generous detour on the way home to Manchester from Aberdeen. My guide and driver in this adventure kept hinting that there was to be one final treat, the one place he would not tell me about in advance. It is that special. Of course we had no more than gotten out of the car when it began to pour rain. Not just a mist like the one that plagued us at Donnattor, but a real find shelter British downpour. We tried to keep dry under the trees of the graveyard around the abby buildings, and ended up pretty wet in the church, along with the rest of the tourists visiting that day. When we ventured out, it was still threatening, so this is as close to the Castle as we got. A difficult shot, due to the light sky behind, and the mist in the air, but then that seems pretty typical of photographic conditions in England. Sony DSC H50 at about 100mm equivalent (to frame the castle behind the sheep). F5.0 @ 1/250th @ ISO 100. Programed Auto. This shot responded amazingly well to the graduated filter effect in Lr. Even using heavy Recovery, I could not get any blue out the sky, but as soon as I applied a graduated filter effect and cranked down the exposure in the top part of the image, the sky detail popped right out. Another graduated filter effect from the bottom to lighten and increase contrast, though I had to go gently as the sheep would not stand much of either. I also used the adjustment brush to increase the brightness and contrast of the castle itself, to counter somewhat the effects of the mist in the air. Normal Vibrance and Clarity settings. Landscape sharpen preset. A touch of noise reduction for the sky. If you were with me yesterday at Donnattor Castle, you’ve already heard the story of this rainy day (just hit the 18 in the calendar to the right). You know it was hard to keep the rain drops off the lens, and if you look closely you will see the evidence of some I missed in this shot. 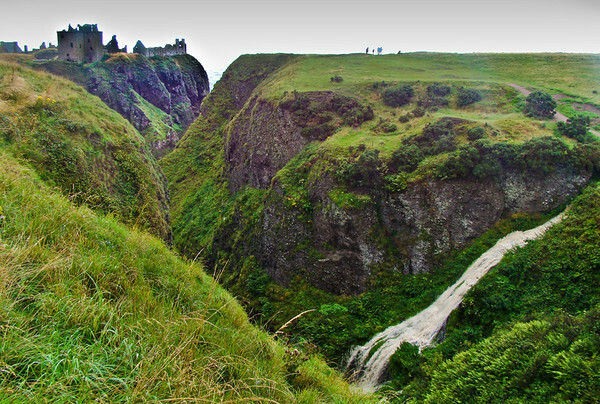 Still, the waterfall and the Castle have to be caught in the same shot. Mandatory. Wasted visit if not. Sony DSC H50 at full wide. F6.3 @ 1/40th @ ISO 100. Programed Auto with program shift for the smaller aperture (and increased depth of field). This is another, that required more than the usual post processing. The castle and cliff edge standing right up against the brightest band of the sky, and the water in the air even at that short distance leaching out the contrast, as well as the range of light…it was all well beyond the ability of the H50s sensor to record. In Lightroom I used 2 graduated filter effects: from the top to darken the sky by reducing exposure, and from the bottom to brighten and increase contrast. I also used the Adjustment brush to paint an adjustment mask over the Castle buildings and the cliff face immediately below. I increased exposure there, and added as much contrast as possible. Globally I brightened the whole image, added some Fill Light to open shadows, moved the black point to the right to deepen definition and colors, and used my normal Vibrance and Clarity settings for the H50. Landscape sharpen preset. Because of the angle of the lens to the horizon (tipped down radically) there was fairly severe vignetting in the top corners. I applied the Vignetting tool in Lr to remove that…and then had to unsaturat the specific blue that was still left in the corners. Finally I cropped out part of the sky to get rid of most of it. The crop actually helped the image by eliminating what turned out to be a distracting area of dead gray at the top. Win win. 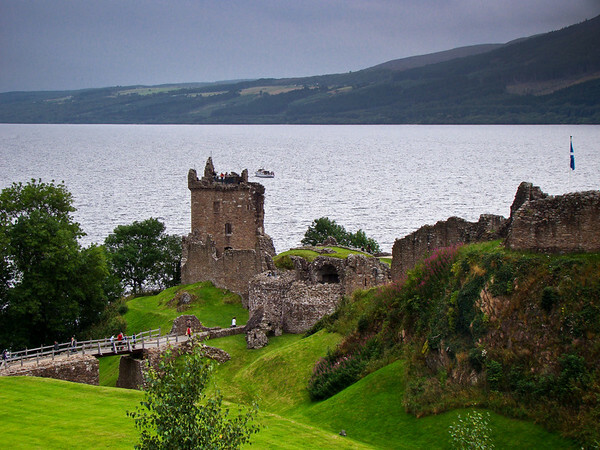 From Scotland (and my last Donnattor Castle shot, I promise). Our host in Aberdeen put us on to this castle, as it would be on our way when we left, so we watched for the signs as drove down the east coast of Scotland in the morning. It was well signed but still not easy to find, being well off the main road. And, of course, when we got there it was raining. Not hard but hard enough to make it a dampish walk the quarter mile or so from the car park, protecting the camera all the way. Ah, but what a beautiful place. Dramatic. Rushing streams pouring down over moss covered cliffs. 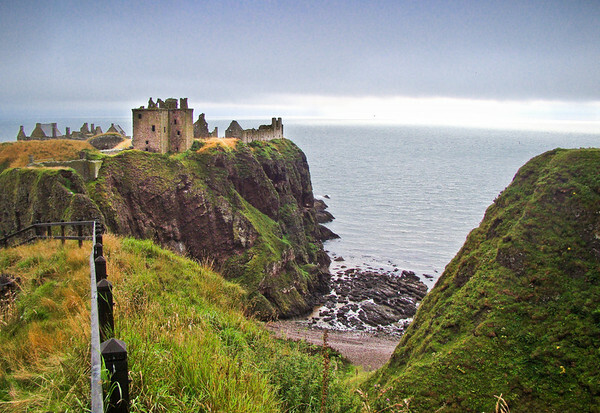 Straight drops to the gray sea, and the Castle ruins standing alone on a promontory so deeply carved it was all but an island. Add the brooding sky and a band of light along horizon where the storm broke and you had the makings of quite a scene. Unfortunately you also had a very difficult photographic challenge. The moss and turf was so dark, and the horizon so bright, with the castle pushed right up against it. Lots of water in the air (not to mention on the lens if not careful) sucking the contrast out of any distance. Still, you have to try. I took maybe thirty different shots, quick grabs when I whipped the camera out, got the shot off, and the camera back in its bag before it got too wet. Of course, I would like to get back here with more time and better weather. I would like to spend a day, or a week, or a year photographing this scenery…but, in fact, I may never get another chance at this landscape. The pictures I took that day in the rain may be my only images of this place. If so, let it be so, and I will make the most of the shots I managed to get. Sony DSC H50 at full wide (31mm equivalent). F4.0 @ 1/250th @ ISO 100. Programed Auto. This shot required a lot more post processing than I normally use. I spent a good ten minutes on it. First a Graduated Filter effect from the top down to the horizon to darken the sky. 2) graduated filter effect from the bottom up to brighten the foreground and add contrast. 3) Adjustment brush applied to the two foreground castle structures, where I applied some exposure and brightness to lighten, along with some added contrast and some sharpening. 4) a second adjustment brush along the length of the low building to pull back the brightness (since at flat wall stood out too much). 5) a third adjustment brush along the bright horizon to pull back the exposure there a little. 6) general increased Vibrance and Clarity, and the Landscape sharpen preset. 6) moved the black point to the right to deepen the colors and added a bit of extra contrast to the whole image. 7)the yellow had become too bright with the exposure adjustments, so I pulled back the saturation of the yellow band in the HSL panel. 8) finally, I used the mouse selection tool in the HSL panel to select the gray of the water and darken it (luminance control). Again, all of this manipulation is only to bring the image back to something like what I saw with my eye. I took this, and other pics of Urquhart Castle literally between raindrops. I had my hand and hat shielding the camera the whole time, wondering just how wet I could get it before something shorted out and I fired the camera. We were considerably damp by the time we got back to the car. And of course, finding a view from the parking lot was next to impossible. They have planted hedges along the edge, on purpose one suspects, to discourage casual enjoyment of the grounds. 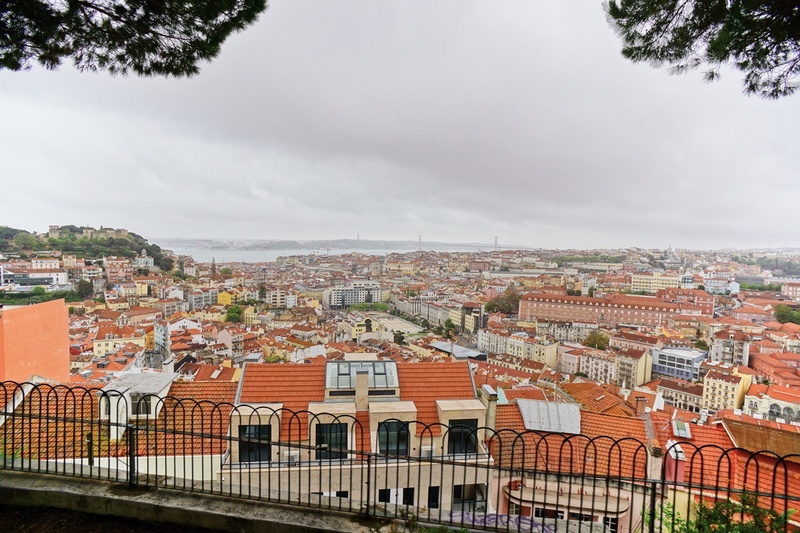 If you want the view they expect you to pay the fee and walk down to the castle. We had no time, and were not so inclined considering the weather. So I was scrambling to get something, anything, worth taking home here. Still, it is a magnificent vista, out over Loch Ness and the Castle, and I did find a gap in the hedge deep enough so that I could tip the LCD out and hold the camera high and get a few views. Next time I will pay the fee (if there is a next time). Sony DSC H50 at about 80mm equivalent. F4.0 @ 1/160th @ ISO 100. Programed Auto. I tipped the camera up to read more sky than foregound, used the exposure lock, and reframed. Still, it needed some help in Lightroom. Graduated filter from the top over the top third of the image to darken the sky to its remembered bleak rainy self, and graduated filter from the bottom over the whole image to brighten and increase contrast. Added Clarity and Vibrance. Landscape sharpen preset. I also touched the blackpoint slightly to the right to deepen the colors and did a minor color temperature adjustment to tame the yellow that brightening the image brought out. 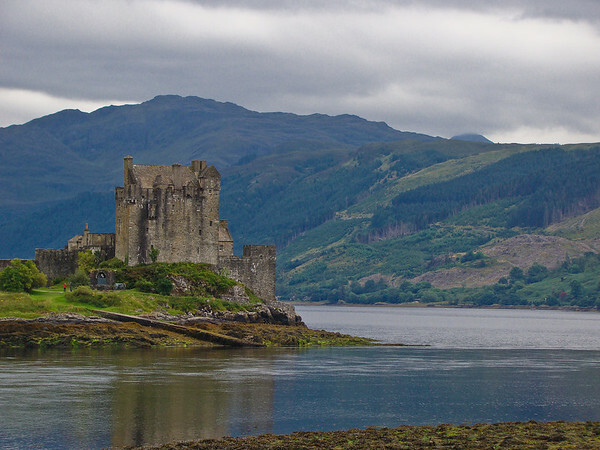 Eilean Donan, the quintessential Scottish Castle, seen in many films, and subject of millions of tourist snapshots, including this one. Catch it on the right day at the right hour and it is magical. I took wide shots, and mid-shots, and full telephoto. This is a medium tele shot for framing. Sony DSC H50 at about 150mm equivalent. F4.0 @ 1/200th @ ISO 100. Programed Auto. Nothing fancy in Lightroom. Recovery for the sky and clouds. Presence increase through Clarity and Vibrance. Landscape sharpen preset. My 4 day trip to Scotland and back through Northumbia was one of the most amazing photographic journeys I have ever taken. A friend and I drove (he drove, I rode) 1400 miles in what amounted to 3 days, as we spent one full day on the islands of North Uist, Benbecula, and South Uist in the Hebrides. The last day, on the way back to Manchester and my flight home, we came down the coast of the North Sea, past a series of amazing castles. The was the last one of the day, and by far the largest. 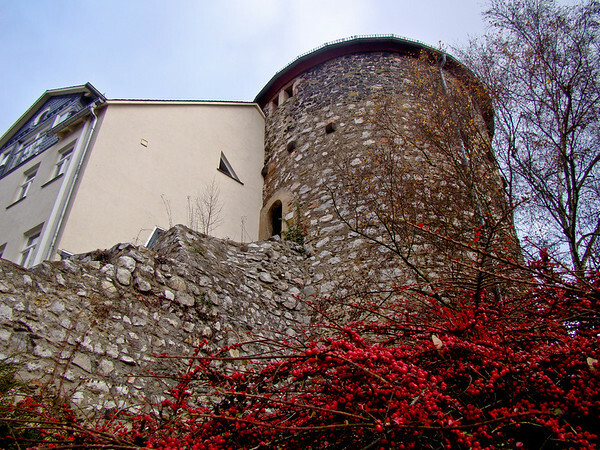 Bamburg Castle. 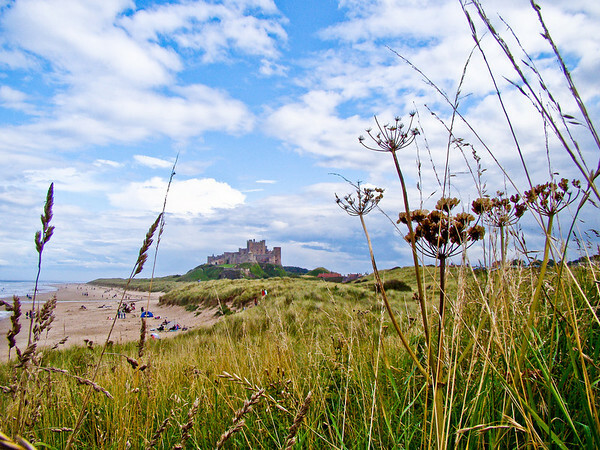 We drove up a side road along the tops of the dunes to get this view back at the Castle. There was some sea mist, mixed with intermittent rain, but we caught the castle in a rare moment of English sun. The mist provides a soft and distant look to the castle, while the grasses in the foreground are sharp and clear. I like the contrast. We spent maybe 15 minutes at this spot, and I tried a variety of angles, most without the immediate foreground. Sony H50. F5.6 @ 1/500 @ ISO 100. Programed Auto. In Lightroom, I used Recovery to pull detail out of the clouds. You can see that the whitest of the clouds is still a bit burned out as the sensor reached the clipping point. Still, a darker exposure would have been hard on the foreground. Added Clarity and Vibrance, and used the Sharpen Landscape preset. For this shot, I also adjusted the contrast slightly, trying to cope with the haze. This is from the Scotland Gallery.